This dazzling space wallpaper from ESO’s La Silla Observatory in Chile shows the bright star cluster Messier 7. This dazzling space wallpaper from ESO’s La Silla Observatory in Chile shows the bright star cluster Messier 7. 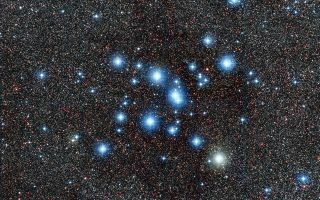 Easily spotted with the naked eye close to the tail of the constellation of Scorpius, it is one of the most prominent open clusters of stars in the sky — making it an important astronomical research target.